Starting Oct. 1, plastic bags will be banned in the Prince William Sound town of Cordova. The ban has been a year in the making, since the Cordova City Council voted unanimously in November 2015 to ban plastic bags and polystyrene foam food containers in the community of 2,200 residents. Bethel and Hooper Bay are two other Alaska communities with plastic bag bans. Others, including Homer, have attempted similar bans in recent years. Homer's ban, first approved by the City Council, lasted only several months before being overturned by a popular vote in 2013. A Fairbanks tax on plastic bags was considered by the City Council in 2009, but community pushback forced the city to rescind the measure before it ever went into effect. 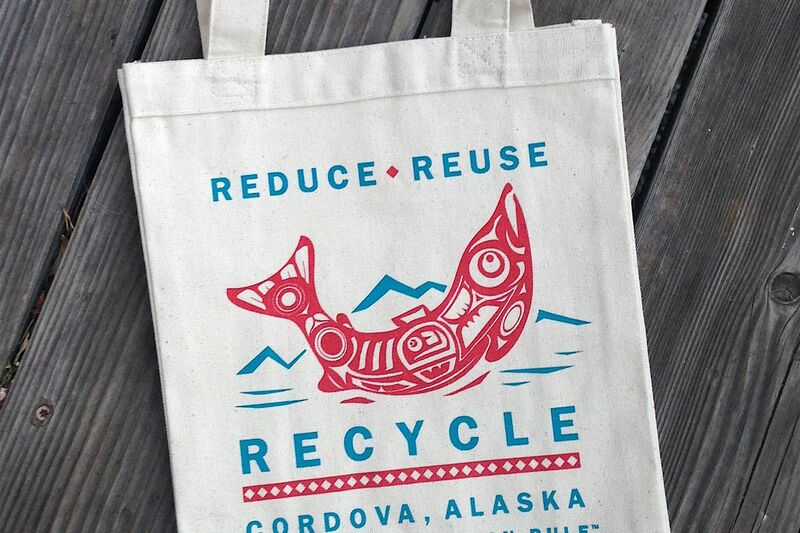 Cordova's one-year lag was to give businesses — there are two main grocery stores in the town — time to adapt to the change, according to Emily Stolarcyk, program manager for the Eyak Preservation Council, the organization that spearheaded the bag ban. Enforcement will be through the police department, with violators facing a fine of up to $1,000. But interim city manager and Police Chief Mike Hicks said it's unlikely the maximum fine would be imposed. He said most retailers have been receptive to the change. "I don't think we're going to have any problems with people switching over," he said. "I think it's going to go just fine." The council brought the idea to the city last year, but it wasn't exactly new. The Cordova High School club Future Problem Solvers suggested the idea to the city years earlier, though it never gained traction. Stolarcyk decided to change that, gathering 300 signatures last summer before bringing the ordinance to the council. She said Cordova, a fishing hub near the mouth of the Copper River, is dependent on healthy oceans. She said a plastic bag ban would help reinforce that message in the community. It would also help clean things up. Stolarcyk said Cordova has some informal recycling but no regular program. She said it's not unusual to see plastic grocery sacks stuck in trees or bushes along the highway leading out to the landfill, 17 miles from the city center. Former mayor Jim Kacsh, who approved the ordinance, said he often goes hunting for rabbits along the road. Bags and plastic foam clamshell boxes dot the landscape. "You wind up sneaking up on a little plastic bag because they look just like the bunny," he said in a phone interview Wednesday. "They're everywhere." He said there was some pushback from retailers during the debate, but it was minimal. Kacsh said he supports the ban, but he admits he's struggled with what to do at his own NAPA Auto Parts store. He's been saving boxes and looking into buying reusable cloth bags for customers. But those are expensive, and customers would have to pay for them. James Brand, branch manager of the AC Value Center in Cordova, the city's largest retailer, said the store is still working through its stock of regular plastic bags. Last year the store handed out 140,000 plastic bags. He said biodegradable bags are in the process of being shipped and will likely be there in time for the ban's implementation Oct. 1. But he said if they aren't the store will still have paper bags. Brand said there was precedent for using biodegradable bags, since the Bethel AC store also uses them. He said the biggest challenge has been trying to get Cordova's sizable transient population to understand the upcoming ban. This summer the store handed out 400 reusable bags hoping to target those customers. They were a hit. "We have a lot of people come through with the cloth bags," Branch said. "It's really is cool to see people embracing it."